Creating a brand personality that extends from the logo to the storefront, and all the personal touches in between. 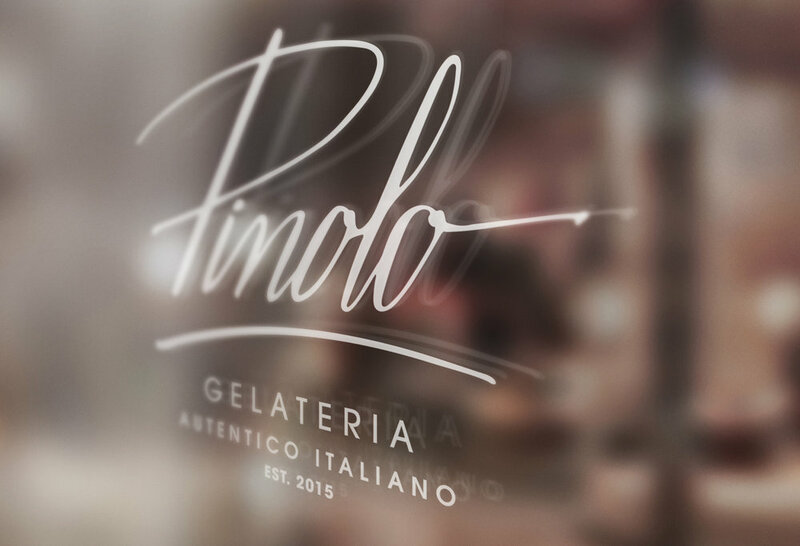 Pinolo Gelateria is an authentic Italian gelato parlor located in Portland, Oregon. Sandro, the store owner makes all the gelato fresh daily—it’s truly a unique tasting experience. The Logo: The primary mark was created by using an old fashioned quill pen and indian ink, resulting in a one-of-a-kind logo type treatment. A secondary mark was added to create a layering effect in packaging along with red stripped tape for fun and practical appeal. Dairy and Non-Dairy are distinguishable by color. I have worked closely with Yvonne over the last year and it has been awesome. In the past, other designers could not deliver what I was looking for. Working with The Study, I was able to receive a customized logo that represented my business perfectly. As an entrepreneur, I appreciated Yvonne offering me a financial plan that worked well with my budget. If you want less headache, I strongly recommend you work with them!